Do you ever wonder why your Board members aren’t engaged in the meetings? Or wish they were more involved with your nonprofit organization? Today most Board meetings are filled with staff reports and lists of mundane action items. This happens meeting after meeting and Board members loose further interest in being engaged. Board members often leave feeling they are making little difference and wondering if there is a better use of their time to make a greater impact somewhere else in the community. Does your Board have any of these trends happening? Or do you see an inkling of boredom beginning at Board meetings? 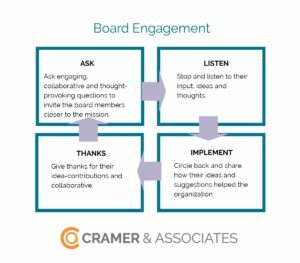 Spend some time in January developing a Board member engagement timeline and strategy to cultivate your Board members’ involvement with your organization. You might be surprised that it all starts with a question. Formulate and ask engaging, collaborative and though-provoking questions to draw your Board member in. This process is an art and takes refinement for each Board member. You will soon learn the various skillsets of each of your Board members and how they like to be involved. As you figure this puzzle out, you can better engage Board members in the meetings, collectively. Couple these tactics with a Board and staff training and the Board member engagement will change drastically in 2018. Board and staff training might include: individual roles, Board member’s purpose and responsibilities, ways to become the best Board member, creating ways to experience the mission moments in Board and staff meetings. With increased involvement, your nonprofit will have more cheerleaders, more skillsets, and more ambassadors reaching out into the community. The outcome is your nonprofit develops new relationships and has more strengths and competencies creating an even greater impact on your mission. In January, take one hour to develop a Board engagement timeline and find a date in the first quarter to conduct a Board and Staff training session to cultivate your Board to be more involved helping them move closer to active participation.